Do you want a free 3D Printed sample? Fill out the Get in Touch form and request your free sample. Angus 3D Solutions provides 3D printing services for jewellers, designers, modellers and others who want to design their own custom pieces, including dental and sculptures. Masters / Patterns in plastic, this allows you to create your own moulds. Wax or resin patterns that can be burnt out during the casting process. The jewellery industry has embracing 3D printing and many jewellers now use the technology day to day. 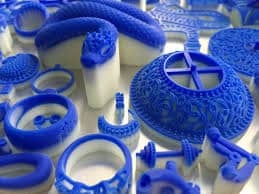 3D printing is now used to create the patterns for investment / Lost-wax-casting and even to print jewellery directly. Investment / Lost-wax-casting is one of the most popular methods of producing jewellery via 3D printing. Castable resins are designed to capture precise details and smooth surfaces. It burns out cleanly, allowing jewellers and casting houses to go straight from digital design to a 3D print suitable for casting. This providing a high micro-casting performance for a variety of applications, such as extremely small and delicate jewellery pieces, medical instruments and other custom cast metal applications. · Very complex designs can be created. Historically, jewellery casting patterns were carved from wax using CNC machines. 3D printing is not restricted by the limitations of CNC machining and is able produce parts that have in the past were impossible to make. Designs can also easily be customised. · With 3D printing, multiple patterns can be made at once and within a very short time frame. This has significantly reduced lead times as well as cost when compared to traditional pattern making techniques. · 3D printing also allows multiple designs to be produced in a single print. This means it is very cost competitive pricing for low production volumes (an important issue for jewellery where customers typically want a one-off piece).